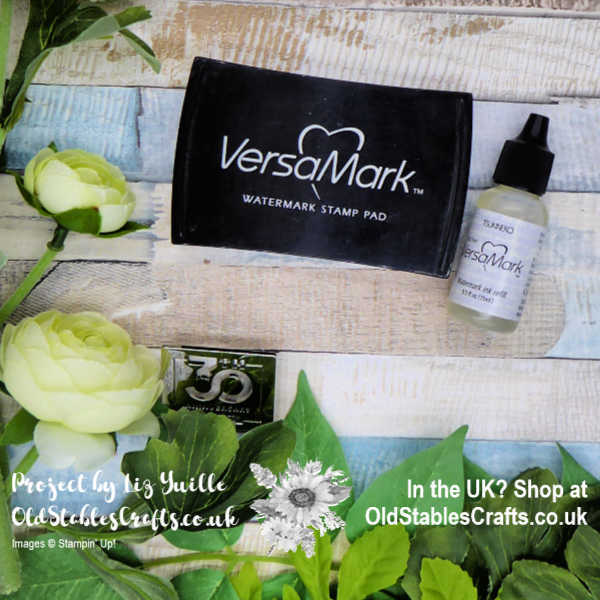 Versamark Ink from Stampin’ Up! – How To. I am sure you have already seen the information I have shared about using some of the other inks that Stampin’ Up! offer. If not, you can find them by searching my website. There is lots of useful information for you to see, so worth a look. Today I am doing a similar post on Versamark Ink. This is a fantastic ink and can be used for all sorts of fantastic techniques. I am probably only going to scratch the surface, so if you have more ideas, please add them to the comments below! When looking at what you can use different inks for, I always like to start by reading the information provided by the manufacturer. On the back of Versamark Ink it says it is a non-toxic (always good to know!) watermark stamp pad. It goes on to say it creates a translucent image and is excellent for background designs. Guess what? It is. Yet most of use will think of Versamark as being used just for Heat Embossing. It is great for that, but heat embossing was not the original purpose for this ink. I love heat embossing, I can watch it for ever. I works brilliantly on cardstock, foil (just be careful) and, Window Sheet. Now this is a full disclosure moment. In the video I applied heat to what I thought was Window Sheet. IT WAS NOT!!! I don’t know how a bit of rogue Acetate ended up in my Window Sheet storage folder, but it did. I have since double checked and can confirm that you CAN heat emboss on the Stampin’ Up! Window Sheet!!! As with all the inks that Stampin’ Up! carry, there is a refill available for your Versamark Ink, so if you look after the actual pad, you should never have to buy a new one! I have had mine for over 10 years!